These startups are crafting bags designed to make your life easier, as you flit from the gym to work to a PTA meeting. Women can now “have it all”–a career, kids, a social life, hobbies–but that means an awful lot of running around throughout the day. Many working women make four or five stops between leaving the house in the morning and heading home at night. Last year, I tracked down and tested the best handbags on the market that are both beautiful and functional, designed to ease the transition from work to PTA meetings to gym classes to cocktails. Several of those bags were equipped with tech features like laptop sleeves or in-bag chargers. As I developed this year’s list, I asked readers for their thoughts and I learned a couple of interesting things. First, many women don’t carry a tablet or laptop, since they can get most of their work done on a smartphone. Second, even though they’re lugging plenty of stuff around, they want their bag to look sleek and compact. I’ve incorporated some of this feedback into the 2017 list. While I did test bags from more established brands, I found that the best-designed models came from startups that spent time iterating on their prototypes and performing user testing in the same vein as a tech company would. The new list includes bags across price points and silhouettes, from camera bags to luggage, but all of them are designed to take you through your day without any fuss. Last year, British best friends Suki Waterhouse (a model) and Poppy Jamie (a TV presenter) launched an accessories company. Their goal was to create products that they wanted but couldn’t find. They started with two leather handbags–a camera case and a tote–that are meant to encompass all you would need for work and life. They’re priced between $200 and $250. My research showed that most women are looking for compact, easy-to-carry bags that can fit a lot of small objects. I tested the camera bag and found it very practical. The 5.5 x 7-inch bag is roomy: It can fit a wallet, sunglasses, a phone, and a charger, without losing its rectangular shape. It comes with a shoulder strap, and you can purchase other strap styles to convert the bag into a waist pack or backpack. The classic silhouette ensures that it’s appropriate for even a formal workplace, but it is versatile, so you can carry it into the weekend, a date, or a party. Pop & Suki also gives you the ability to customize in fun ways. I tried the camera bag in the brand’s classic “millennial pink,” but it comes in a wide range of colors, including black, white, and lavender. For $40, you can have your name, monogram, or preferred emojis printed on the bottom—a spot that isn’t always visible. You can also purchase a range of tassels, tags, and keychains. A good bet for young professionals with an after-work social life. Jackie Harman, a tech executive, had spent years looking for a leather tote that she could carry every single day. It seemed like a fairly simple ask, but she couldn’t find one that fit the bill. There was always some issue: too big, too small, or not enough pockets (which inevitably leads to wasting time digging for keys). 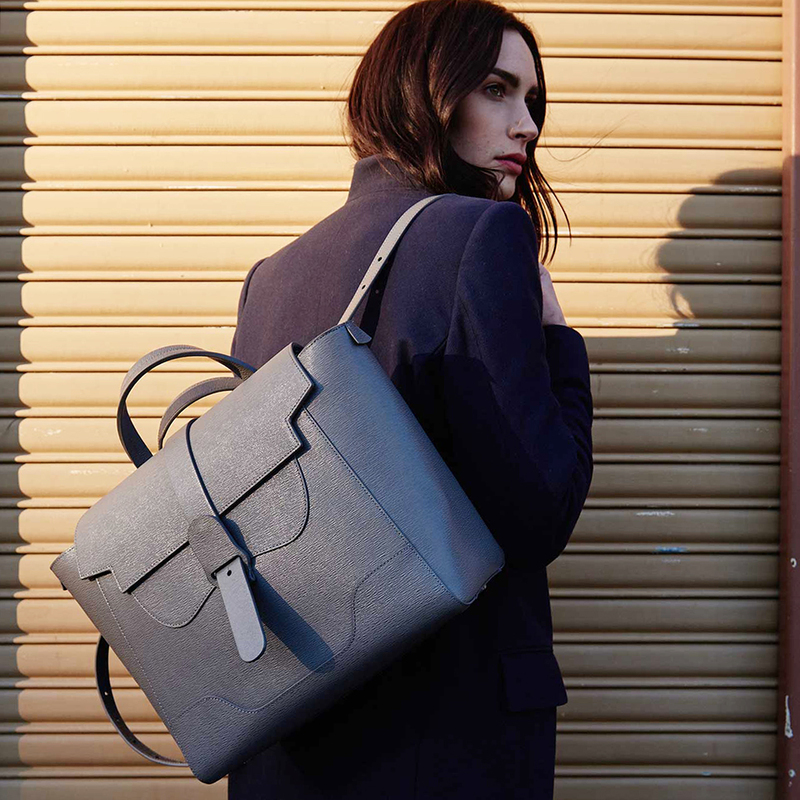 Last year, she quit her job in New York, moved to Los Angeles, and set up the bag company Coyn. She’s spent a year perfecting the design of her one and only product: a $345 full-grain leather bag that is made in Italy. At 13 x 14 inches, the shoulder satchel can fit plenty without the wearer having to tug at the straps, which are thick and well-reinforced. For work, I loaded it with my laptop in the designated sleeve, along with books and magazines in the main compartment. There are smaller pockets for everyday items like chargers, wallet, makeup, and water bottle, and there’s a keychain strap. On the weekend, the bag miraculously transformed into a diaper bag. My daughter’s milk bottle slipped into the water bottle slot, while the main compartment fit diapers, toys, and snacks. The genius lies in the bag’s ability to look big or small depending on how much stuff you’re toting around. For days when you don’t have so much to carry, you can fold the sides inward, creating a sleek square shape. Fashion, as you may have heard, is the world’s second most polluting industry, after oil. While clothing brands like Reformation and Patagonia are leading the charge for creating more ecologically responsible clothing, it’s hard to find higher-end bags that are also eco-friendly. Vicki von Holzhausen is hoping to change that. She was an award-winning car designer for Audi and Mercedes. But two years ago, she decided to launch her own luxury bag company, using the same principles of design, functionality, and sustainability she learned from the auto industry. Her goal is to find the most responsible approaches to bag-making, without compromising on style or quality. Most of her bags are made of leathers that are by-products of the food industry and tanned in non-polluting ways. Von Holzhausen has also invented an entirely new material, called Technik Leather, that feels just like the real deal, but is completely animal-free. Von Holzhausen has a minimalistic aesthetic, using muted natural colors and black handles with knotted cords. She offers a variety of silhouettes and sizes that cost between $395 and $795. I tested the $550 bag that is simply called the “handheld.” For work, I carried it like a satchel, which made it a bit more formal. Measuring 10 x 12 inches, it does not accommodate a laptop, but it easily fit a tablet, together with everything I needed for a full day at work, including gym clothes and a cardigan. The style of the bag carries over to the weekend, where I carried it as a cross-body bag using the strap. Women who travel frequently often struggle to find luggage that is both elegant and practical. For those focused on pragmatism, there are many new brands on the market–like Away and Raden–that offer good hardshell cases in a variety of colors. But if you’re in search of an attractive leather bag, you’re looking at luxury brands, such as Louis Vuitton or Givenchy, that cost several thousand dollars. Jetsetter Tanya Pham just launched a new brand called Latitu that offers leather bags between $350 and $895 that are both feminine and full of little details meant to ease your traveler’s stress. 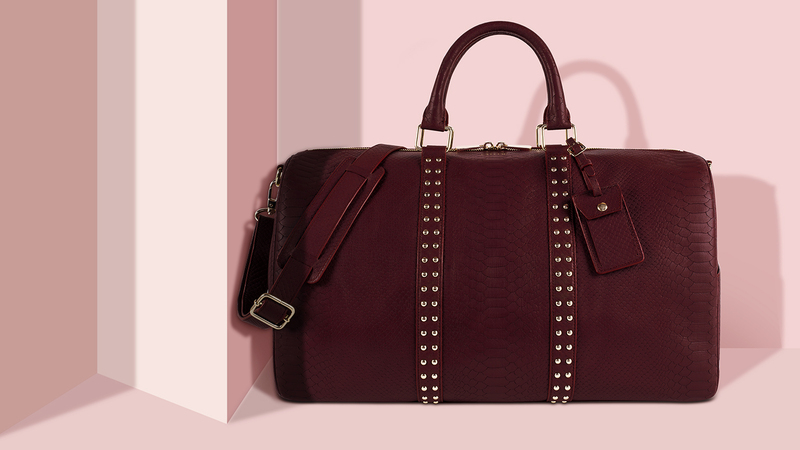 The bags are made of Italian leather embossed with a crocodile pattern and plenty of studs. 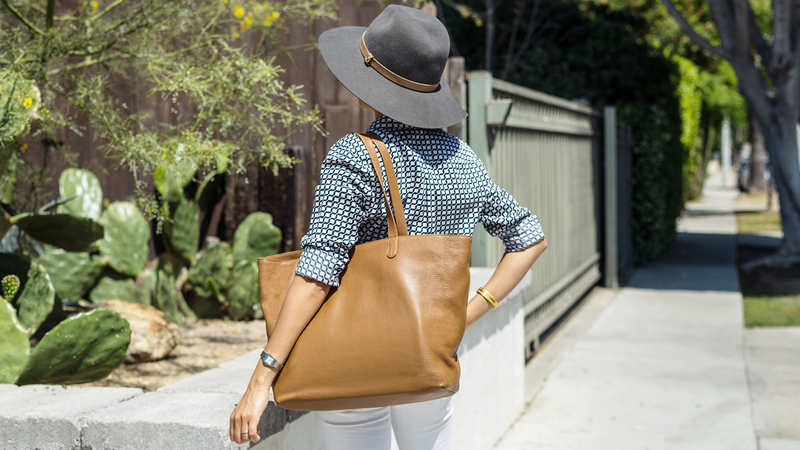 She offers three different silhouettes: a backpack, a weekender, and a duffle. The latter two come with a leather pouch that can be used as an inside pocket or detached like a clutch so you can keep your passport and tickets in hand as you’re waiting to board. On the back, there is a pocket that you can slip onto the trolley handle of a suitcase. The duffle also comes with a hidden side compartment to store shoes or dirty laundry. Women who love toting around a bag from their favorite luxury label often find themselves trading aesthetics for functionality. Every season, Celine, Louis Vuitton, Hermes, and Balenciaga, among others, churn out new collections of beautifully crafted bags that tend to be lacking in extras like a protective sleeve for a tablet or laptop, or multiple pockets for phones and chargers. Often they are made from high-end leathers that scratch or stain easily, so wearers have to be careful about how they handle the bag. Senreve cofounders Coral Chung and Wendy Wen, whose former careers involved stints at VC and consulting firms, were the very women who loved their swish sacks, but often carried a cheaper, more practical option when they traveled or went to a meeting. With Senreve, they’ve launched a collection of made-in-Italy leather bags priced between $495 and $895 that are designed to appeal to the discerning high-end traveler. The brand’s direct-to-consumer approach means that the bags are a tad cheaper than products of similar quality from other luxury brands. I tested Senreve’s hero bag, the Maestra, made from a sturdy Italian leather with a suede interior. I opted for the light blue “ice” color and found that after rigorous use–and a minor incident involving a sticky-fingered toddler–the 13 X 10-inch bag was no worse for the wear. The genius of the Maestra is that it can be carried in four different configurations–backpack, cross-body, shoulder bag, and satchel–that all look good. It comes with seven handy pockets, including a laptop sleeve. And still, the bag never looks bulky. It has a distinct architectural aesthetic that stands out without being too loud. I carried the Maestra as a backpack when I was running after my daughter in the playground in the morning, then as a more formal satchel when I went to a couple of meetings in town. I was able to fit my work items, plus my daughter’s snacks and bottle, without the bag looking bulky. This year’s startups have all innovated in clever ways, but more importantly, they are listening to consumers. Designing for modern women’s needs, these brands are moving one step closer to that elusive pie-in-the-accessories sky: the perfect bag.